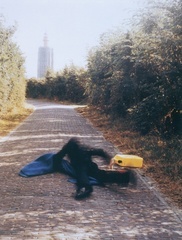 A screening of four of Bas Jan Ader’s Falling films, introduced by curator Pedro de Llano, is followed by contributions from Jan Verwoert, Janice Kerbel, Mary Sue Ader Anderson and Erik Ader, all examining the enduring legacy of this influential Dutch artist. Forty years after the end of his incredibly brief career, conceptual artist Bas Jan Ader’s concise body of work continues to inspire artists, writers, curators and critical thinkers. As the publication of a major new book of writings on and by the artist approaches, this event provides an extraordinary opportunity to hear from some of the key figures in Ader’s life and those who have studied and presented his work. The event opens with a screening of four of Bas Jan Ader’s short Falling films, introduced by Pedro de Llano, curator of the exhibition of the artist’s work held in 2010 at the Centro Galego d’Arte Contemporanea. Curator and writer Jan Verwoert and Turner Prize nominated artist Janice Kerbelthen present individual responses to themes in Ader’s work, covering themes from the existential to slapstick, gravity and landscape. Finally, the speakers are joined by Ader’s widow Mary Sue Ader Anderson, his brother Erik Ader and Nick Baker, curator of the concurrent show of the artists’ work at Simon Lee Gallery. Bas Jan Ader (1942 – 1975) was born in Winschoten, The Netherlands and lived in Los Angeles for the last twelve years of his life. He received his BFA from Otis College of Art and Design, Los Angeles and his MFA from Claremont Graduate School, California. His work has been exhibited widely in recent years including exhibitions at the Museum of Contemporary Art, Los Angeles; the Centro Galego de Arte Contemporánea, Spain; the Museo d’Arte Moderna di Bologna, Italy; the 30th Sao Paolo Biennial; Camden Art Centre, London; the Museum of Modern Art, New York; Palais de Toyko, Paris; the Art Institute of Chicago and The Brooklyn Museum of Art.